Recently I received an e-mail from Mike of the It’s Brutal website. He informed me of an upcoming Amiga games competition being hosted by Lemon Amiga and the English Amiga Board. Please read on for more information! It’s a Knockout! 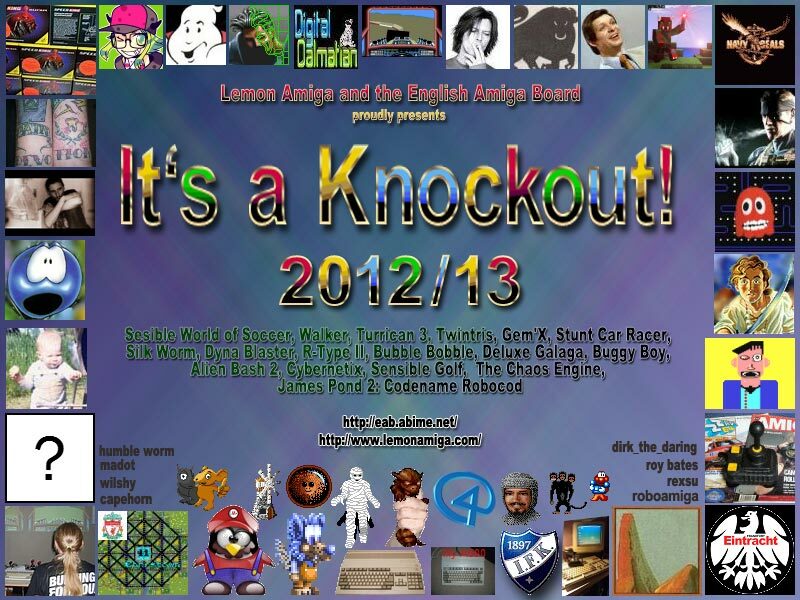 is a classic Amiga knock-out tournament run by the forum members of Lemon Amiga and English Amiga Board. Returning for a 4th time, the ever-popular knockout tournament takes centre stage once more. Five games will be played over seven weeks. Score high and knock out your opponents. The first round of competition will be a qualifying round. The following rounds will be run in a round-robin format until only 2 competitors remain! The final two will battle it out to be the “It’s a Knockout! 2012/13” Champion. Sounds great, doesn’t it? If you think you’ve got what it takes, why not sign up and compete with others? The voting has already started, so head over there and cast your votes for your favourite games.. 🙂 You’ll find the links above. Thanks to Mike for providing the info. Add the Final Gate to that list of games and I’m in! Thanks for commenting. 🙂 I remember the review you wrote of that game.. hehe..